And it hasn’t. We passed a law called MICRA in 1975 that limited noneconomic damages in malpractice cases to $250,000. Adjusted for inflation, that cap is now about the equivalent of $60,000. Nonetheless, its impact on malpractice premiums has been negligible. The chart below comes from the Foundation for Taxpayer and Consumer Rights, which definitely has a dog in the fight since it was founded by insurance industry scourge Harvey Rosenfield, who championed Proposition 103, an initiative that implemented state approval of insurance rates. It was passed in 1988. Still, the results are pretty clear. 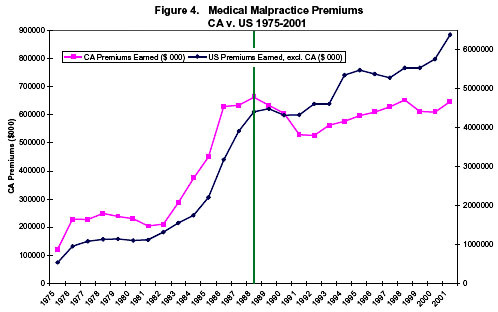 After 1975, malpractice premiums continued to zoom upward, rising at an even higher rate than in other states. But after 1988 (that’s the green line for easy reference), California premiums leveled off while rates in the rest of the country continued to rise. The reason for this is pretty simple: large damage awards are actually pretty rare and don’t make up a huge proportion of total malpractice payouts. Capping them changes the picture, but it doesn’t change it that much. But it does substantially cut into trial lawyer income. Which, of course, is the whole point. If you want to annoy trial lawyers, you should cap damages. If you really want to reform malpractice law, however, look elsewhere.